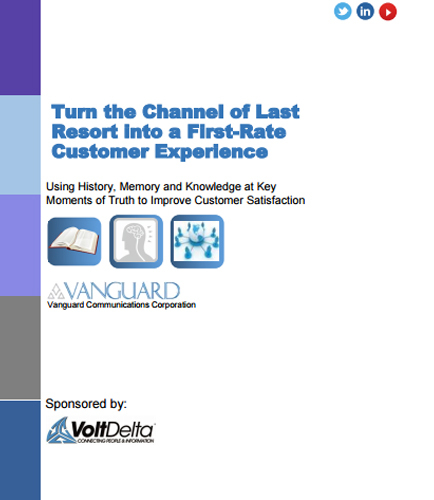 How to Turn the Channel of Last Resort into a First-Rate Customer Experience? "How to Turn the Channel of Last Resort into a First-Rate Customer Experience?" With the explosion of new channels over the past decade, our customers are able to choose any number of ways to interact with us. For many, voice has become the channel they use when they need to escalate an issue; the channel of last resort. Today’s call center is not lacking data. But the manual process of analyzing voice recordings in search of business opportunities is labor intensive and costly. And it takes time— time that could be better spent exploiting new-found insights to improve business processes. By replacing human call scoring with an automated call solution offered by contact centers, call-tracking services and hosted PBXs can save a considerable amount of time and money. Your clients will be interested in a solution that accelerates the call-scoring process, saves money, and enables a new level of intelligence to be gleaned from customer calls. VoiceBase Predictive Analytic is just such a solution. Automatically mining the rich data in spoken interactions opens the door to a wealth of possibilities. Read this whitepaper for predictive insight on automated call & scoring leads for today's call center systems. Past several decades showed nothing much of improvement in the technological perspective of the telephony technology. Though the presence of archaic PBX system still consumes a major part of market share, the present day Unified Communications however promises much more to offer with its major upheaval. PBX hardware for contact centers will be nearly vestigial in a few years – Skype for Business will be better for your contact center in the future, even if it doesn’t look like the hardware you may be used to with phone wires sticking out of it. Learn how a Skype for business contact center is a great fit for: • Multi-channel communications • Cloud contact centers • Development and extensibility • Employee mobility • Significant cost savings Read this informative white paper on what you can accomplish with a Skype for Business contact center. What is Contact Center ? A contact center or customer interaction center is a central point in an enterprise that is equipped to handle large amounts of customer telephone requests for an organization. It is basically a computer-based system that provides call and contact routing with specialist answering “agent” stations and a sophisticated real-time contact management system, for high-volume telephony transactions. What is ERP Implementation ? ERP implementation best practices include selecting and deploying a solution in an organization. It helps in improving the operation performance and improving the customer experience.